It is true to say that fish living and thriving in a sparkling aquarium have a very therapeutic and curious effect on countless people. This is not surprising when you consider that many Asian and other world cultures and beliefs place great importance on fish. In Chinese and Japanese culture, for example, ancient mythology links well looked after fish with harmony, wealth and prosperity. This beneficial relationship is included in practices such as Feng Shui which encourage the right management of aquaria in the home to ferment success. This ancient art is today widely practised even in the West to bring one’s soul closer to nature and eventually to harmonise with it. The ultimate goal being to repel bad karma and move toward spiritual wellness. In the culture of my homeland, Japan, the koi carp is a greatly esteemed and very symbolic fish that is closely tied to our national identity. The koi carp is believed to be a symbol of luck, prosperity, and happiness. You may not be aware that name “koi” is in itself Japanese in origin and means “carp”. Cultural and spiritual associations aside some people merely find the aquarium a pleasant addition to the interior of their home and just like to watch and perhaps learn from their fish. Whatever the reason for keeping an aquarium every fish needs optimal conditions in which to survive and thrive. But a complete aquarium does not just contain water and fish (as pure and straightforward as they may sound). So do live plants provide anything other than aesthetic value? 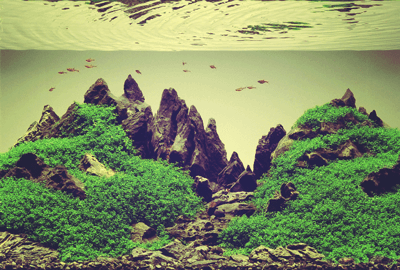 Aquarium Plants are an important part of aquaculture because they exist in the natural environment of the fish. Choosing between artificial and live plants is challenging given they have varying requirements and can be costly or time-consuming. Many say both are equally as good for a stable submerged ecosystem. In the not so distant past live plants were very easy to spot; today, however with silk and high-quality plastic it no longer a simple exercise. With quality artificial plants becoming better by the day aesthetics is no longer an issue, and a lot of aquascape enthusiasts will inform you it really just comes to a matter of personal choice. It could be argued that live plants have a symbiotic relationship with the fish while artificial plants are purely ornamental. It could also be said that live plants absorb biological waste from defecation that could be hazardous to the fish and also aid in the reduction of unsightly algae growth in your aquarium. However these days there are other ways to combat this perhaps more efficiently than having to maintain aquatic horticulture along with the fish themselves. The plants I design and manufacture are made to the highest standards and will look superb in any aquarium, why not put them to the test? My silk aquarium plant range can be found here and my premium plastic range here.